OAKLAND, Calif., Feb. 8, 2017 /PRNewswire/ -- After more than 20 years of making delicious, full-flavored, sensibly-sized frozen treats, Skinny Cow is excited to debut all new recipes for their new and legacy treats, in addition to a new brand look and feel. 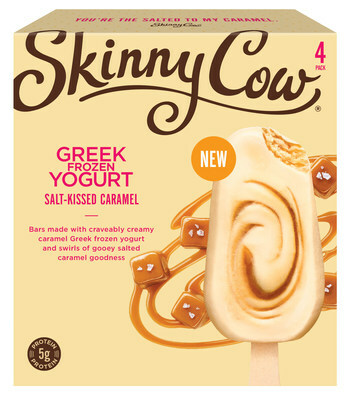 Accompanying the Skinny Cow brand's new look and recipes is the latest addition to their portfolio of frozen treats: Skinny Cow Greek Frozen Yogurt Bars in two deliciously creamy flavors, Salt-Kissed Caramel and Chocolate Fudgetastic Swirl. "Individual preferences and expectations are always evolving and now, more than ever, consumers are looking for quality ingredients in the foods they purchase. Over the past 23 years, Skinny Cow has developed indulgent products and treats – and this year the brand is delighted to announce that it has updated its recipes to incorporate delicious ingredients you can feel good about, without changing the flavors our fans love," said Kevin George, Director of Marketing -- Snacks Portfolio at Nestle Dreyer's Ice Cream. "We're also rolling out a new line of Greek Frozen Yogurt Bars, giving our customers even more ways to indulge from ice cream sandwiches, to frozen candy bars, to cones – and now Greek frozen yogurt," said George. UPDATED SKINNY COW RECIPES: Skinny Cow has updated the recipes across its portfolio of frozen treats to shorten the ingredient list and remove unfamiliar ingredients. The updated recipes source milk from cows not treated with rBST*. While the recipes and ingredients have changed, the rich, indulgent flavors Skinny Cow fans have come to love remain the same. SKINNY COW GREEK FROZEN YOGURT BARS: Skinny Cow has added Greek Frozen Yogurt Bars to its selection of indulgent frozen treats. The Skinny Cow Greek Frozen Yogurt Bars feature two decadent flavors – Salt-Kissed Caramel and Chocolate Fudgetastic Swirl – both with five grams of protein, and 100 and 110 calories respectively. Salted caramel whirls and swirls its way through sweet caramel Greek frozen yogurt in the Salt-Kissed Caramel bars, while the Chocolate Fudgetastic Swirl bar starts with creamy chocolate Greek frozen yogurt and adds in ripples of chocolate fudgey goodness. These new Skinny Cow Greek frozen yogurt products will soon be available in the frozen section at participating retail stores nationwide with a suggested retail price of $5.49. SKINNY COW PACKAGING MAKEOVER: With the Skinny Cow brand's new recipes comes new packaging that puts the spotlight on both the deliciously indulgent product and its quality ingredients. The new packaging also brings bright and bold energy to the brand and can be found in frozen sections of stores nationwide in the coming months. 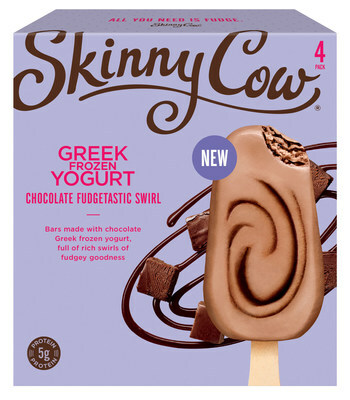 The Skinny Cow brand offers a decadent portfolio of frozen snacks, including indulgent ice cream sandwiches, ice cream cones, ice cream bars, the NEW Greek frozen yogurt bars, and divinely satisfying Skinny Cow candies. Skinny Cow frozen treats and candies are every day indulgences made with quality ingredients for a simply delicious taste. At Skinny Cow, we believe that life is meant to be lived and dessert is meant to be eaten. For additional product news and information, visit the new www.SkinnyCow.com. Want to connect with other fans of the Skinny Cow brand on Facebook, Twitter, or Instagram? Log on to www.facebook.com/SkinnyCow, or follow @SkinnyCowUS on Twitter and Instagram to get the latest scoop on the latest product and flavor news, delicious offers and more. Check it out! Named one of "The World's Most Admired Food Companies" in Fortune magazine for seventeen consecutive years, Nestlé provides quality brands that bring flavor to life every day. From nutritious meals with Lean Cuisine® to baking traditions with Nestlé® Toll House®, Nestlé USA makes delicious, convenient, and nutritious food and beverage products that make good living possible. That's what "Nestlé. Good Food, Good Life" is all about. Well-known Nestlé USA brands include: Nestlé® Toll House®, Nestlé® Nesquik®, Nestlé® Coffee-mate®, Stouffer's®, Lean Cuisine®, HOT POCKETS® and LEAN POCKETS® brand sandwiches, Nescafé®, NESTLÉ® Juicy Juice®, Buitoni®, SKINNY COW®, DREYER'S/EDY'S®, Nestlé® Crunch®, Nestlé® Butterfinger®, Wonka®, DIGIORNO®, TOMBSTONE® and CALIFORNIA PIZZA KITCHEN® frozen pizza. Nestlé USA, with 2015 sales of $26 billion, is part of Nestlé S.A. in Vevey, Switzerland — the world's largest food company with a commitment to Nutrition, Health & Wellness — with 2015 sales of $89 billion. For product news and information, visit Nestleusa.com or Facebook.com/NestleUSA. *No significant difference has been shown between milk from rBST treated and non-rBST treated cows.